Underneath Windows Explorer’s docile exterior beats the heart of a powerful, adroit assistant. You need to do a bit of tweaking, but if you spend a few minutes to apply these suggestions, you can emerge with a world-class file handler that saves you time, day after day. There’s a sneaky way to make sure folders and files you use all the time “rise to the top” in folder lists: Put an underscore at the front of the folder’s or file’s name. For example, if you always want to see your company’s Human Resources folder at the top of the list, call it _Human Resources. There are dozens of ways to name folders (and files) so they stay in order. Using numbers at the beginning of the folder’s name works well: 00 Admin, 01 Copy Edit, 02 Tech Edit, and so on. If you identify folders by date, use the Year-Month-Day format so they’ll appear in the proper order. So, for example, use 2010 01 15 Comments, 2010 01 28 Comments, 2010 02 03 Comments, and so on. Windows has this nasty habit of hiding files from you. As long as you’re computer-savvy enough to know not to delete files with names like cmd.exe or shell32.dll, there’s no reason in the world why you can’t see all the files on your computer. 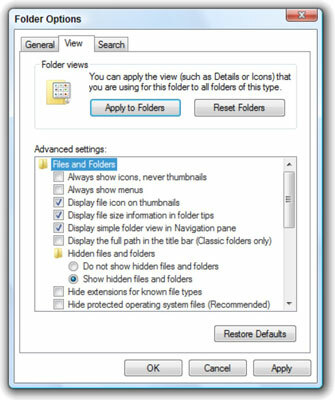 Open Windows Explorer (choose Start→Computer), press Alt, and then choose Tools→Folder Options→View. Click the Show Hidden Files and Folders radio button. These are files and folders with the so-called “hidden attribute” set. Uncheck the Hide Protected Operating System Files (Recommended) check box. If you make “Protected Operating System Files” visible, you’re going to see some strange files and shortcuts that most mortals never encounter. If such oddities mystify you unnecessarily, by all means keep this box checked. Otherwise, uncheck the box and dive right in. When you uncheck the Hide Protected Operating System Files (Recommended) box, Windows warns you that you shouldn’t mess around with system files and asks whether you’re sure you want to make them visible. Your Folder Options dialog box now looks like the one shown in the previous figure. Click OK to make your folder options changes permanent; then “X” out of Windows Explorer.